Please consider contributing to VISIONS Contemporary Ballet and help support this company of dedicated, amazingly talented dancers and Ranardo-Domeico Grays, Founder/Artistic Director/Choreographer, in the presentation of the company's annual concert in New York and creation of "Queen of Soul" in dedication to the late Aretha Franklin, being performed at the Charles Wright Museum of African American History in Detroit, Michigan! I am writing in hopes of raising funds in the amount of $5,000 by November 10th needed for expenses involved in presenting our fall concert in New York and the completion of my new piece "Queen of Soul," dedicated to Aretha Franklin, being performed at the Charles Wright Museum of African American History in Detroit, Michigan. Funds will help cover rehearsal space rental, dancers' rehearsal and performance stipends, theater rental, travel expenses, and technical and administrative costs. Feature Article: Check it out! I was recently featured in The Field's Meet Our Artist on September 1, 2019. My Story: As a brain cancer survivor, I feel that The Lord has given me the opportunity to present VISIONS Contemporary Ballet to the community with more focus and even more passion than ever. After taking two years off for treatment I returned to VCB with even more of a story to share. Creatively flourishing, currently I am working on our fall program, Healing Works II, in which my newly completed work, Dash - Between, will be presented along with three other spiritually uplifting contemporary ballets. As a native of Detroit, Michigan, I will be returning home for the first time since leaving to attend the famed Juilliard School in New York, to bring my company home and share my work with the community that first nurtured dance in my life presenting "Queen of Soul" a new piece dedicated to Aretha Franklin. Support: I hope you can help by making a donation of any size. We are looking to raise funds in the amount of $7,000. Every donation helps--$10, $25, $50 or more. 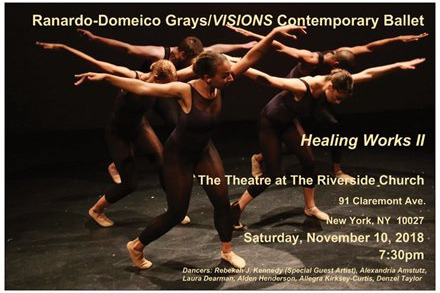 Ranardo-Domeico Grays / VISIONS Contemporary Ballet is a sponsored artist with The Field, a not-for-profit, tax-exempt, 501(c)(3) organization serving the performing arts community. Contributions to The Field earmarked for Ranardo-Domeico Grays / VISIONS Contemporary Ballet are tax-deductible to the extent allowed by law. 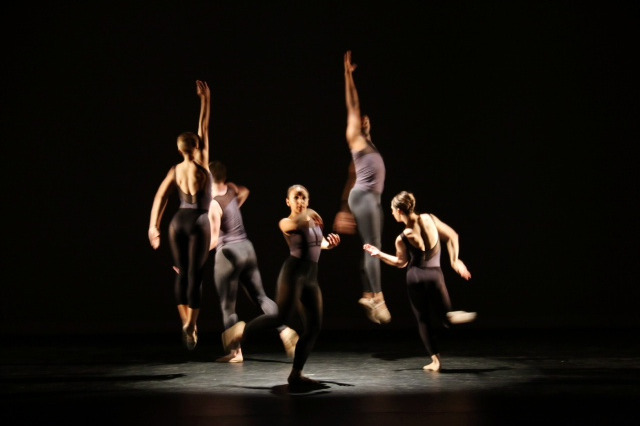 Ranardo-Domeico Grays' VISIONS Contemporary Ballet wants to thank you for helping us have such a wonderful year. You have supported us this year by attending our performances, giving donations and telling others about us. Since returning to the dance world in 2016 after recovering from brain cancer, I have now completed three ballets. This year I completed "Dash-Between" and also choreographed a piece dedicated to Aretha Franklin, "Queen of Soul,” both of which were recently performed on tour in Detroit. This past year we also performed in New York in our annual concert, "Healing Works II," at The Theatre at the Riverside Church, in the American Cancer Society/Making Strides Against Breast Cancer Walk event at the Bandshell in Central Park, and in the Fast Forward series at Dixon Place. Check out our Detroit Tour Recap Video for a behind the scenes view of our Detroit tour. If you are considering making a donation it's not too late! I am very grateful that The Lord has given me the opportunity to work with amazingly talented dancers and share my uplifting ballets with the community. Your support will make a difference in peoples lives by bringing "Healing Works II" to the community. VISIONS Contemporary Ballet recently performed my newly completed ballet "Dash-Between" presented in Fast Forward at Dixon Place. It was AMAZING! You can still catch us performing in support of the American Cancer Society Making Strides in Central Park next Sunday, Oct. 11th. Not to miss! Our annual concert in Healing Works II at The Theatre at Riverside Church next month Saturday, Nov. 10th.